In a piece in WaPo today, I note in passing that there’s no persistent correlation between top tax rates and growth rates across the US time series, nor in oft-cited international data from Saez et al. This is widely understood among empirical public finance folks, but just in case, here are a few figures. As Krugman did the other day, I’m using top marginal income tax rates and 10-year, annualized growth rates of real GDP per capita. First, as Paul’s figure suggests, here’s a scatterplot that looks pretty random. One can, of course, plunk a regression line in there, and it has the “wrong” slope (higher rates associated with faster growth). To be clear, I neither think nor claim that higher top rates lead to faster growth (though such a case is sometimes made). These are just correlations. There’s heightened nervousness about the next recession and there are signs pointing in both directions. I can’t turn around without seeing or hearing people worrying more about the next recession. My peeps at the Indicator have a nice podcast on the topic. The WSJ points out that more than half of economists they surveyed expect a downturn by 2020, which, in case you live under a rock, the article helpfully notes is an election year. The reasons for the heightened anxiety are:–Slower global growth, particularly in China (also Europe and Japan). Remember how Apple’s market cap fell 10 percent in one day a couple of weeks ago. That was on the news that their China sales were down. We’re all connected, man…also, trade war. There’s a deservedly nice bit of buzz about a new paper by tony economist Olivier Blanchard. My WaPo piece today takes you through the argument, along with a heavy dose of my own interpretation, one familiar to OTE readers. I recently spoke to members of Congress and referenced a number of pieces. Here are the links to those pieces. What are some ideas for lowering the growth of health costs? See the section starting on pg. 11 of this testimony. On our lack of investment in quality, affordable pre-K, and how we’re an international outlier in that regard. Look carefully at the 2nd figure–it tells this story well. On some ideas for progressively raising revenues. Also, see this on a financial transaction tax. On the need for fiscal stimulus in the next recession, even at “high” levels of the debt/GDP ratio. On lowering the black/white unemployment gap. Share the post "Links referenced in a recent talk"
I testified today before the House Financial Services Committee at a hearing the Republicans called “The perils of ignoring the national debt.” As I tweeted earlier today, the hearing was delayed a hour because the R’s went off to vote on a tax cut adding another $100 billion to the 10-year debt. That bill is unlikely to get very far in the Senate, but it does raise a somewhat existential question about the urgency of all this hand-wringing about the debt. I’ve been remiss in keeping up with this blog. While I still post here–especially stuff that’s too technical to go elsewhere and my write-up of the monthly jobs numbers–I’ve taken to posting most weekly takes on this or that to my PostEverything WaPo column. —This one’s more political than usual: I pushback on Frank Bruni’s NYT oped arguing that my former boss VP Biden shouldn’t run in 2020. To be clear, I don’t know who should run, but neither does anybody else. According to Wikipedia, Nick Hanauer is “an American entrepreneur and venture capitalist.” True, but very incomplete. Hanauer is also a prominent progressive thinker, advocate, funder, and writer. I’ll get to the purpose of this post in a moment (to amplify a new piece out today in the journal Democracy) but I’ve long appreciated Hanauer’s ability to frame economic problems and solutions in ways that both make common sense and point the way forward toward bolder policies than many of us tend to come up with. Payrolls were up 155,000 last month, and the unemployment rate held steady at 3.7 percent, close to a 50-year low. Hourly wages were up by 3.1 percent over the past year, the same rate as last month and tied for a cyclical high. 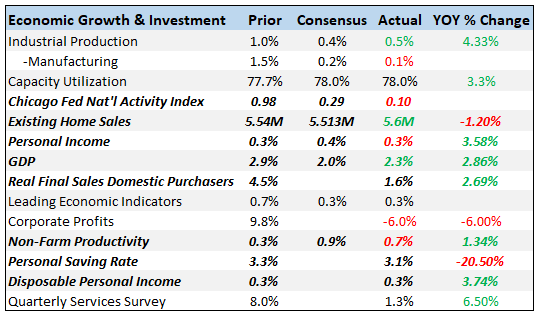 Though another in a string of solid job reports, the pace of job gains downshifted a bit compared to last month’s report, average weekly hours ticked down slightly, and both the job and wage numbers came in below market expectations. That said, monthly noise, weather and other one-off effects (winter storms, fires) can influence monthly data, and the underlying trend remains that of a labor market closing in on full employment. As long as we’re sitting here on pins and needles re the midterms, let’s distract ourselves with some analysis of the state of the wage/price passthrough. Though not quite at the level of flipping the House, this is important information regarding inflation, interest rates, and Fed policy. As the job market has improved, wage growth has picked up. Last week, two closely watched hourly wage series—the Employment Cost Index and the Establishment Survey wage—hit 3 percent growth on a yr/yr, nominal basis, about double their growth rate from five or six years ago. I’m am avid listener to the NY Times podcast, The Daily, and I much enjoyed, if that’s the right word given the difficult topic, last Friday’s show on the urgency of pushing back on climate change. The show included an insightful discussion with recent Nobel laureate William Nordhaus on the importance of taxing carbon. I’ve got a piece in today’s WaPo focusing on how the tax cuts have broken an important, fiscal linkage between budget deficits and the strength of the economy. “When we close on full economic capacity, as is currently the case, tax revenues as a share of the economy should significantly rise, and deficits should fall. Instead, revenues have come way down, and deficits have climbed. Why is the deficit 17 percent higher than last year, especially when the economy is growing faster, and unemployment is lower? There’s a new analysis out by a group of economists from the Goldman Sachs economic research team that raises the question of what the concept of full employment means in an era when the central bank expends significant and successful efforts to anchor inflationary expectations. The nation’s payrolls grew by 134,000 jobs last month and the unemployment rate fell to a 49-year low of 3.7 percent. While the jobs number came in well below expectations, that should not be considered bad news. First, Hurricane Florence may have slightly dampened monthly payrolls (see below discussion of the impact of hurricanes on the jobs data). But more importantly, upward revisions for the prior two months’ data reveal a trend over the past three months of 190,000 jobs per month, a solid pace of job gains for this stage of the labor market recovery. Hourly pay was up 2.8 percent, just slightly off last month’s cyclical high of 2.9 percent. I’ve got a piece in the WaPo today that presents findings from the model described in more detail here. The model is a panel of the 50 states plus DC from 1979 to 2017 of wage, labor market, and minimum wage data. The results derive from fixed effects, panel regressions of the change in the log of the state real, 10th percentile wage on state unemployment and the change in the minimum wage variable. For this variable, I used the ratio of the state minimum wage in state i, year t, divided by the federal minimum wage in year t. Standard errors are clustered at the state level (results below).